The Capaz Law Firm was named to the University of Florida’s 2019 Gator100 for the second consecutive year during a ceremony held at UF’s J. Wayne Reitz Union Grand Ballroom. The Gator100 recognizes the 100 fastest-growing businesses owned or led by UF alumni. To qualify, companies must have been in business for five or more years and have had verifiable annual revenues of $250,000 or more every year since 2015. Additionally, the UF alumnus or alumni must have met specific leadership criteria. 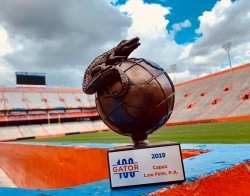 Tampa, FL, March 01, 2019 --(PR.com)-- The Capaz Law Firm was named to the University of Florida’s 2019 Gator100 for the second consecutive year during a ceremony held at UF’s J. Wayne Reitz Union Grand Ballroom. The Capaz Law Firm was founded in 2012 by Tampa attorney Dereck Capaz. After obtaining an undergraduate degree from the University of Florida’s Warrington College of Business in 2000, Mr. Capaz went on to receive Master of Business Administration and Juris Doctor Degrees from Stetson University College of Law. Located in Tampa, the Capaz Law Firm focuses its practice in the areas of civil litigation and plaintiff’s personal injury, including tractor-trailer accidents, auto accidents and other catastrophic injuries. The Firm’s continued commitment to providing personalized representation to each client has earned Mr. Capaz recognition as an AV-Preeminent rated attorney, as well as membership to the Million Dollar Advocates Forum and Florida Super Lawyers. Founded the company and been active as a member of the most senior management team from January 1, 2015, through September 28, 2018. View the full list of the 2019 Gator100 honorees at gator100.ufl.edu.